When the future of genetic engineering arrived on Sebastian Cocioba’s doorstep, it was affixed to the back of a postcard from Austria with a little bit of packing tape. Cocioba is a 25-year-old college dropout whose primary interest is tinkering with plant genetics in a lab he cobbled together from eBay. The lab is located in the spare bedroom of his parent’s lavish apartment in Long Island City, across the river from Manhattan. A few months ago, an internet friend from an online bio-hacking forum had sent him the lab's latest addition: attached to that postcard was Crispr-Cas9. Sebastian Cocioba with the Crispr protein shipped to him in the mail by a friend. Deposited onto a flimsy fragment of filter paper and wrapped in plastic, it looked like a tab of acid. But inside that crude packaging was the key to an incredibly precise DNA-editing technology that will revolutionize the world. Crispr—a memorable acronym for the mouthful, “clustered regularly-interspaced short palindromic repeats”—gives scientists an unprecedented ability to decrypt and reorder genes, opening up a dazzling and terrifying universe of possibilities. This year, a top national security official called gene-editing a weapon of mass destruction—along with nuclear detonation, chemical weapons and cruise missiles—because it could be used to create "potentially harmful biological agents or products." Crispr is every sci-fi future that we have ever dreamed about or feared: designer babies, unlimited energy, and the end of genetic diseases like Alzheimer's. Researchers have used Crispr to make wheat resistant to a damaging blight; to alter 62 pig genes so they could, theoretically, grow human organs for transplant; and to edit a human embryo to repair a gene that causes a fatal blood disorder. 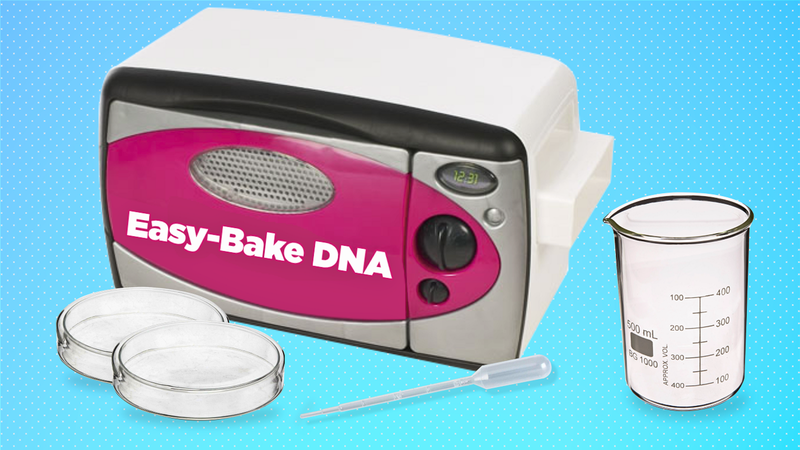 But the biggest bonus in the eyes of DIY biohackers is that it makes at-home genetic experimentation astonishingly accessible. Sebastian Cocioba in his parents living room, in which dozens of plants he has grown help mask the scent of his parents' smoking. “If the genome was a book and you wanted to sneak a sentence into the middle and make it look like it was there the whole time, Crispr can do that,” Cocioba explained, vibrating with enthusiasm as he held between his thumb and forefinger a plastic-wrapped Pandora's box. Crispr, which arrived on the science scene in 2012, has made genetic engineering simpler, faster, and cheaper—and galvanized the movement of DIY scientists who want to try their hand at genetically modifying plants, insects, animals, and, someday, maybe even humans. David Ishee, a 30-year-old Mississippi resident who never attended college, first started doing at-home experiments after seeing kits to make glowing plants online. Crispr, he said, will vastly expand the kind of experiments he’s able to do at home. Software like DeskGen already allows anyone to easily design custom DNA sequences and then have them delivered to their doorstep for a few hundred dollars. Crispr will allow Ishee to then insert those genes into a host organism with relative ease. "Crispr is great because it's simple and cheap to use for precision genomic insertion, editing or deletion with a lot of different kinds of cells," he told me. "That gives me a lot of new options. Up until now, all the genetic edits I've made have been limited to plasmids and unguided genomic insertions. That limits the kinds of cells I can work with and the types of work I can do." When synthetic biology’s most prominent scientists gathered last year in Napa to debate the ethical implications of genetic engineering, Nobel prize-winning molecular biologist David Baltimore lamented in his opening remarks that the simplicity of Crispr has been overhyped. "It's not something you can do in a garage," he said. Last year, a former NASA researcher raised more than $65,000 on Indiegogo to create and sell DIY Crispr kits, suggesting in a YouTube video that his NASA lab could be recreated “on a kitchen table.” This month, Genspace, a community DIY bio lab in Brooklyn, began offering Crispr workshops, spurred by the demands of a “Crispr craze” among DIY biologists. Cocioba is currently plotting his first Crispr experiment: knocking out the gene in Oxalis corniculata (a.k.a. sourgrass) that can cause kidney stones for people and animals that eat too much of it. Willy Wonka, he told me, is his inspiration. Wonka may have been a little nuts, but he dedicated his life to engineering fantastical new things to give to the world. “I want to make white plants, blue plants, glowing plants, plants that when you touch them they curl up, all kinds of things,” Cocioba said. His current obsession is genetically engineering a blue rose—none of the other blue roses on the market, he says, are truly "cerulean blue." But his ultimate goal is to be taken seriously as a scientist. He wants to make useful discoveries, engineer interesting plants and publish his work. Just as a bunch of engineers and computer hobbyists in a garage ushered in the modern era of personal computing, it could very well be biohackers like Cocioba that lead the way to the future of genetic engineering—that is, if somebody doesn’t try to stop them first. Cocioba’s tiny laboratory is cramped, but it has an expansive view of the Manhattan skyline. When I first visited, I looked out the window and immediately thought about a different city (London) and a more traditionally trained scientist (Alexander Fleming). Fleming discovered penicillin in 1928, basically by accident. While trying to find a cure for Staphylococcus, he went on vacation and forgot to sterilize his petri dishes or close the window. He returned to find that a cure had literally blown in, in the form of the common mold Penicillium notatum. His carelessness sparked the revolution of modern antibiotics and saved millions of lives. Accidents happen all the time in science. Sometimes it’s the result of being sloppy, like that time drunk physicists discovered that red wine increases superconductivity. Sometimes it's just good fortune, as with the discovery of Crispr: researchers in the 1980s and again in 2012 were looking for something else entirely when they made the discoveries that led to the development of the gene-editing technique. But not all accidents are guaranteed to have happy outcomes. What if, instead of penicillin, something had blown into that window that caused Staphylococcus to undergo a super-strength mutation and the bacteria had gotten out? If Alexander Fleming couldn’t remember to sterilize his lab space and shut the windows, what can we expect of a 25-year-old working out of his parents’ spare room? I looked around at Cocioba’s assembly of gene guns, DNA amplifier machines and grow-light plant experiments and imagined a dystopian future in which some kind of plant pathogen escapes from the lab and kills off all of New York City’s plant life. Sebastian Cocioba in the lab he built in his parents Long Island City apartment. This kind of doomsday hand-wringing has caused some to wonder whether DIY biology should require licensing and regulation, or perhaps be stopped altogether. At a “collaborative biohacking” panel I attended at the technology conference South by Southwest this month, a woman who introduced herself as a “Ph.D. scientist” stood up to pronounce her horror that amateurs were performing synthetic biology experiments at home. Sarah Richardson, a panelist and molecular biologist at Lawrence Berkeley National Laboratory, responded that it’s not that easy to cook up a pathogen, even for a scientist with a Ph.D.
“Frankly, I’m less scared of the people in their garages than the people in institutions,” she said. Besides, she went on, some rewards are worth the risk. Other scientists I spoke to echoed Richardson’s insistence that my fears were misplaced. There are limitations to what a DIY scientist can actually pull off. You might be able to order custom DNA sequences on the internet, but there is no Amazon for human embryos nor YouTube videos explaining how to implant them into humans. And you still need to master the technical know-how of what to splice and where. Also assuaging the fears of scientists is that DIY bio is a tight-knit community with a rigorous sense of ethics and safety. When DIY bio first started to develop in the early aughts, it was mainly individual hobbyists working out of labs in their garages. Now, a decade-plus later, the amateurs, enthusiasts, students and trained scientists that make up the movement tend to work together in designated community labs built out in commercial spaces. The DIY bio community's demographics and how they have changed over time. A recent study of the DIY bio community by the Woodrow Wilson Center debunked the "seven myths about do-it-yourself biology," such as the belief that DIYers work alone, are averse to government oversight and could unleash a deadly epidemic. Todd Kuiken, an environmental scientist who worked on the study, told me that while scientists tend to only think about the ethical implications of their work after the studies have already been done, the DIY bio community started organizing early on to establish its own safety and ethical principles. “They organized in a much more proactive way than I would say the professional scientific community has," Kuiken said. Through DIYbio.org, biohackers can access the community’s code of ethics or ask a professional biosafety expert a question. The FBI’s bioterrorism division keeps tabs on the community but has basically asked that it police itself. Plus, Kuiken pointed out, the same regulations that govern what scientists are allowed to release beyond the laboratory doors apply to DIYers, too. Cocioba told me that while there’s no laws that say whether or not it’s legal to create genetically modified organisms in his home, he decided to be cautious and only use his home lab for research. He uses the School of Visual Art’s bioart lab, where he is a scientific consultant, to do the actual modifying. “At home I don’t really have anything more dangerous than the stuff that’s under your kitchen sink,” he said. Kevin Esvelt, the pioneering Harvard University biologist working with Crispr and gene drives to engineer malaria-resistant mosquitoes, told me that he’d like to see the culture of ethics and safety that exists in the DIY bio world move into institutional science. “I’m really not concerned about the DIY bio community right now,” he told me. “So you turn fruit flies yellow? So what. Natural selection is still going to weed that out." Esvelt has concerns about the ethical implications of Crispr, but like Richardson is more wary of the professionals than amateurs. The biggest threat that the DIY Crispr enthusiast poses, he said, is stoking public fears about the mad scientist in their kitchen. "It’s fine to do experiments in your kitchen as long as you sterilize it,” he said. The best way to improve the safety of science, he said, would be to create new rules requiring all scientists to register their work. “As long as science is done behind closed doors, people have no reason trust science,” he said. I went into this story terrified of the calamity DIY biologists could unleash on the world, but experts convinced me that even if biohackers had the technical ability to create something terrifying, they probably wouldn't. When forging a path to the future, there is always risk, but opening up the doors of science to so many new minds makes the risk seem worth it. If Cocioba is the citizen scientist looking to make his way into the scientific establishment using a back door, Josiah Zayner is the anarchist trying to smash that door down. Zayner wants science to be for the masses. He's sick of articles that tell us scientists have made major strides in some amazing technology, such as invisibility cloaks, but that a version for the public is still at least 10 years away. Josiah Zayner, spinning down some DNA in his apartment kitchen. After getting a Ph.D from the University of Chicago, Zayner went on to NASA as a synthetic biology fellow to work on engineering bacteria for terraforming Mars. But his scientific interests were not always in line with NASA's so he decided to set up his own lab. "All my friends right now are working post-doc jobs earning $40,000 a year with their Ph.D. It’s this cultish system and the idea that one day they could have their own lab holds them in it," he told me. "I’m just like f*** the system. Science is a classist thing. DIYbio can break that down." So he created an Indiegogo campaign to sell Crispr kits to anyone who wants them and launched The Odin, an online store that sells inexpensive DIYbio supplies. His big dream is to help people with cancer learn how to hack their own disease by using Crispr to delete the part of the body’s cells causing them to mutate. Zayner does all of his work from a two-story apartment in suburban Castro Valley, California, where he recently moved because it has a garage for his lab. He had me do a simple experiment with him to turn yeast red in order to demonstrate how easy it is to use Crispr. We worked in his kitchen, right alongside all the dirty bachelor-pad dishes. Josiah Zayner with yeast that has been turned red using Crispr in his apartment kitchen. What Zayner and Cocioba have in common is the fundamental belief that you don't need a Ph.D. to be a scientist. Both are driven by the view that any sharp, scientifically inclined mind can contribute to the body of science—and that the more minds are dedicated to solving the world's scientific problems, the faster we'll solve them. The computer programmer is a fitting analogy. Computers were the domain of government and academia until the equipment became relatively cheap and small. It was only then that a band of determined hobbyists and engineers formed the Homebrew Computer Club, leading us all down the path to our modern world of smartphones, tablets and social media, where everyone is a computer expert of sorts. Right now, the genetic engineering revolution is in its early days, comparable to the point in the Homebrew revolution when hobbyists were making computer memory by wrapping magnetic tape around a copper wire. The mainstream biohacker’s day has not yet come but it almost certainly will. Zayner told me that most people who write to him about using Crispr want to create something novel and silly, like a glow-in-the-dark cat. But genetic engineering, he told me, will one day solve all of the world's troubles. He believes the biggest hurdle to getting there is getting people familiar enough with technologies like Crispr so that they realize how difficult a task it is to engineer harm. "What’s the worst that can happen?" he told me. "Well, obviously the worst that can happen is somebody creates a disease that turns the world into zombies." But he assured me that won't happen. Kristen is a technology reporter for Fusion. She enjoys tea, giraffes and the occasional app.